(Maytham Alzayer/The Daily Northwestern) State Sen. Daniel Biss (D-Evanston) speaks at a town hall on Tuesday. Biss urged attendees to engage in politics. State Sen. Daniel Biss (D-Evanston) urged residents at a town hall meeting on Tuesday to not remain silent on political and social issues in 2017, especially as uncertainty reigns at the state and federal levels. Biss hosted the two-hour discussion at the Fleetwood-Jourdain Community Center, 1655 Foster St., and spoke about numerous issues facing Illinois and the country in 2017, including the likely repeal of the Affordable Care Act and the unprecedented state budget impasse. Biss told the audience of about 120 people that they cannot go about their daily lives assuming lawmakers will take care of issues facing the state and nation. The incoming Trump administration forces Illinois residents and Americans to act and stand up for their beliefs, he said. He added that Evanston Township High School District 202’s statement supporting its students and encouraging diversity at the school after the November election is an example of protecting those under a perceived threat. He also highlighted how Evanston and its City Council have already stood up to threats to undocumented immigrants by strengthening its “welcoming city” ordinance. “There’s no reason the state of Illinois shouldn’t do the same thing,” Biss said. Biss also brought up an Illinois law that makes abortion illegal in the state if the U.S. Supreme Court overturns the historic Roe v. Wade decision. Biss said many people not have talked about the law in the past because the assumption was the Supreme Court would not overturn its decision. This assumption is not so certain anymore, he said. Biss said a bill has already been introduced in the Illinois House of Representatives that would repeal the state law that makes abortion illegal if Roe v. Wade is overturned. He said this is first on a long list of issues — including protections for women, workers and people of color — that he said are now potentially threatened by the incoming presidential administration. Biss spoke extensively about the Affordable Care Act and said 1.2 million people in Illinois would lose coverage if Congress repeals the law. He encouraged attendees to contact Gov. Bruce Rauner or their local legislators about their opinions on the Affordable Care Act. 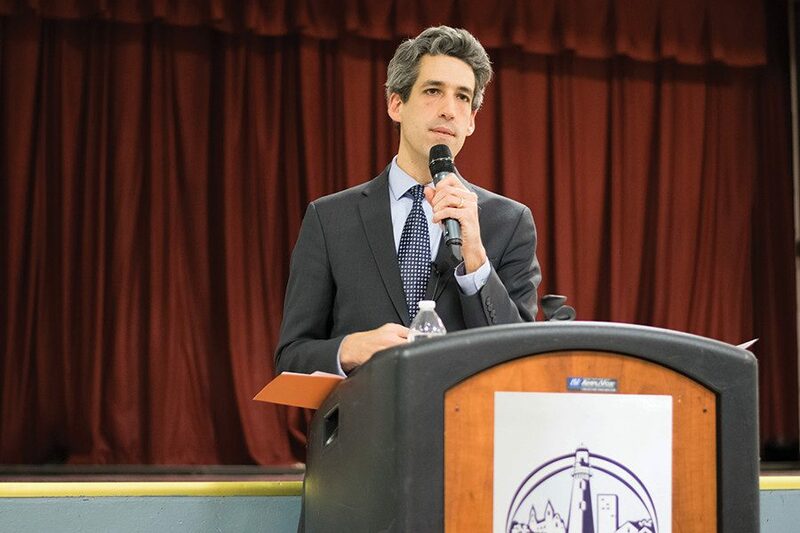 Biss also discussed the ongoing state budget stalemate and how he has tried to organize Democratic politicians to put together an agenda for the state. However, Biss said solving the budget crisis is not easy with a governor and politicians unwilling to compromise. Elizabeth Hayford, a School of Education and Social Policy professor and member of the League of Women Voters of Evanston, said the town hall was useful for learning more about what is going on in Illinois politics. Biss struck an optimistic tone throughout the evening, she said. “In spite of his optimism, it’s hard to be optimistic,” Hayford said. Biss concluded the evening by stating that although the state and country faces immense challenges, it’s on each citizen to seize the opportunities also available to each person.